The Marina Glass Floating Thermometer is designed to float in the water in a vertical position and comes with a suction cup for optional installation on your aquarium glass if required. Accurate and easy to read, it provides temperature readings in both Centigrade and Fahrenheit. It also has a safety zone temperature range indicator for most tropical fish. 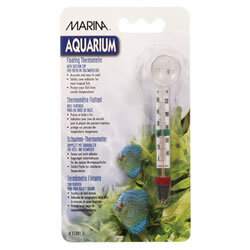 This Floating Thermometer is ideal for use in both fresh and salt water aquariums.